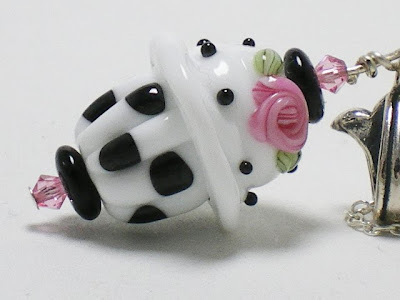 Can you believe this...a checkerboard cupcake! Those are actually black dots, but when the artist pressed in the "liner" grooves, it slightly squared the dots...and I love it! And, good old Target had cupcake tissue paper in the dollar bins today! I've never seen this before so I was very happy but had to hold back from buying a ton of it since I use tissue paper about once a year. 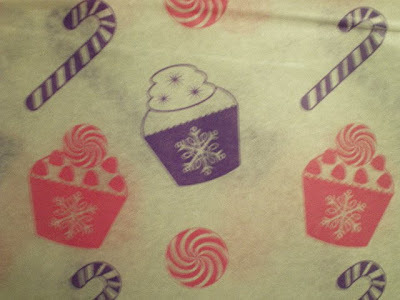 The pack has 15 sheets, 5 each of purple, white and cupcake. Wish they would have made the white a pink...I mean, how many people even WANT white tissue paper these days when there are such cool choices out there? I hope you're not going too crazy over holiday prep. We are lucky enough to be going to my sister's home in Napa and she and her husband and father-in-law love making the turkey dinner for others, so I guess I might just be washing dishes this time around. And I hope you are happy with what you have. None of us have everything we want. No matter what level we are financially, there is always something more to desire, so my goal is to enjoy what I have right NOW....and dream about and worked towards the rest. Each day this week I'm listing holiday earrings. Can you believe the amazing swirls of color in these first two pair??? The large beads are hollow and it's amazing they can be so strong. Kind of like how the arches of a building or bridge actually increases their strength. Just unbelievable. Above is Golden Amethyst Hollows. I've had these beads for so long, I can't recall who made them and I am so sorry about that. Perhaps she will see this post and let us know! I call this pair Egyptian Blue Hollows. I also will list a couple of simple and elegant pairs, like these Emerald Crystal Drops. Hi everyone. Well, I'm behind my schedule of finishing pieces I've been teasing you with, so I thought I'd show you goodies I'll be posting this week on my Etsy site. First up is this pair of earrings featuring wonderful pumpkin beads I call "punks". The glass used is Red Roof Tile which produced a deep, smoky orange for something different than your usual orange. I just love this color, especially with the grey-green tendrils that are on all sides of these plump beads. Then, to continue the holiday theme, I have a SnowGent and SnowLady in necklace form. Their little mufflers are so cute and go all the way around their necks! There's been much going on around here that has pulled me away from my studio and now it is November, so I HAVE to get back on track. The plan is to post some destash holiday charms in sterling silver in my MomsArt shop and to finish that new line of cupcakes I KEEP talking about!! !